Zero Gravity treads new territory for poetry. Its title sequence is part space documentary, part requiem, drawing on Gwyneth's experience of watching her American cousin, astronaut Joe Tanner, helping to repair the Hubble Space Telescope. The poem also considers internal journeys, including death, and is a memorial to her sister-in-law, who died of cancer at the time of the space mission. The whole collection uses fables of self to view scenes from a marriage and to describe the experience of simply seeing. "True starts in poetry like Gwyneth Lewis always match berilliance with warmth. She is one to bet on". Les Murray. 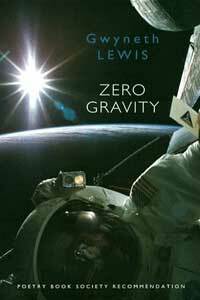 Zero Gravity was shortlisted for the Forward Prize and was a Poetry Book Society Recommendation. It was made into a BBC documentary of the same name, directed by Karen Whiteside and shown on BBC Wales and BBC 2. The Poet and the Astronaut followed Gwyneth to another space launch in Florida and was broadacast on BBC Radio 4, produced by Jeremy Grange.